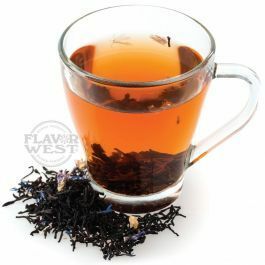 Black tea flavor rich profile can either be sweet or savory which makes it one of a kind flavor in a drink or beverage . Type: Black Tea Water Soluble Flavoring. Ingredients: Natural and Artificial Flavoring, Propylene Glycol and Water. USP Kosher Grade Flavoring. Usage Rate: 15-20% for E-use. Flavor suitability: Drinks, beverages and more. Specific Gravity: 1.02 No Refunds on Flavoring. We use this flavor to make a very unique mixed berry tea that is more popular than any flavor I have seen.